This morning I woke up feeling great. Completely exhausted, but great. Today was the day I put the cap on my biggest training week in almost two years. After using the month of September to get back into the training routine, this week I decided to step up the training. I did two workouts a day on most days, and even did three yesterday. I started in the morning by going for a two hour run, then played an intense game of Ulitmate Frisbee in the afternoon and finished up at night with a really fun, but really hard Night Orienteering race at Kincaid Park. I was very sore as I crawled out of bed, but today would be easier. Just a mellow 3 hour run with Scott McArt to finish off the week. With those three hours, I would reach 18 hours for the week. Huge considering I had been averaging about 8-10 hours/week for most of the summer. Scott and I were headed up to Symphony Lakes, where I took some great foliage pictures last month. From the start I was exhausted. I couldn't keep up. Scott would run ahead and I would do my best to keep him from getting more than a minute or two in front. We ran from the trailhead, up to Symphony Lakes, crossing a large boulder field on the way. We then climbed up a small peak for a view before turning around and heading back. As we were crossing back across the boulder field, we stopped for a minute to discuss our route, or something like that. As we started back up, with the smooth trail only a short way ahead of us, I slipped. Normally if you slip or trip while running, you fall forward 'superman' style. While sometime painful, this kind of fall allows you to put a hand out and cushion the fall. When I slipped, possibly because the rock moved or I stepped on ice (I'm not sure), my foot slipped down and backwards. My other foot then stumbled into another rock as I tried to regain my footing and I fell over backwards. As I was falling, I remember knowing that I was not in a posistion to break my fall with an arm or anything. I was thinking that I was going to hit my head hard on a rock and there was nothing I could do. Sure enough. Whack! The most vicious blow to the head I have ever had (and I wrecked a few bike helmets in my days). I hit so hard that I thought I had cracked my skull. I jumped back to my feet as quickly as I could and quickly reached for the back of my head with my left hand. I was still concious, this was good. I felt the back of my head and was relieved to find it still intact. But as I lowered my left arm after the inspection, I discovered a new problem. My collarbone was moving around in a most un-natural way. Scott asked if I was okay. "Umm yeah, I think so. But I think I broke my collarbone." 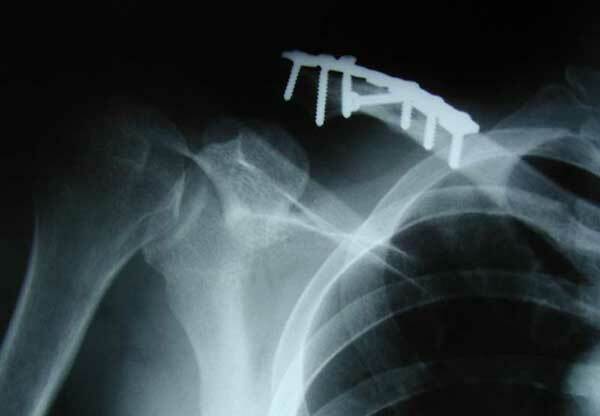 I had never broken a collarbone before, but there was no mistaking the feeling. Bone was moving around where there was no joint. I pulled my let arm in tight against my body and began walking back towards the car. We still had about six miles to go to the trailhead and I steeled myself for the long, painful walk. I spent the walk convincing myself that it wasn't so bad. My head appeared to be okay and that was the important part. I was thinking that collarbones heal fast. They'll give me a sling and I might only be out of commision for a month or so. The pain wasn't excruciating, maybe the break wasn't that bad. At one point I got sick of walking and started running again. The pain of the bouncing was bearable, but the pain of breathing heavily was too much. I walked. An hour and a half later we reached the trailhead and Scott drove me half an hour to the emergency room. 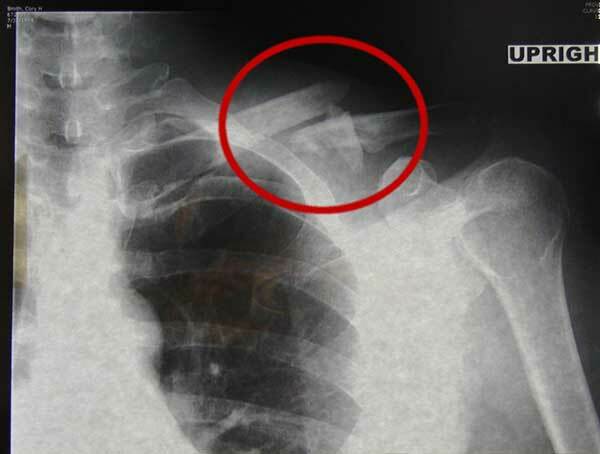 X-rays in the ER confirmed the break. But it was worse than I expected. The bone had shattered into three pieces: the two ends, which weren't even close to touching each other, and a section in the middle that was poking up into the skin. For your enjoyment, here is that xray. The ER doctor said I would need surgery to install a metal plate. This kind of break would not heal on its own. Crap, there goes my insurance deductible. They sent me home and scheduled a surgery for Tuesday. I spent the next day at home on the couch afraid to move waiting for my sugery the next morning. A big metal plate and seven screws holding me together. I spent the next few days on the couch, doped up on some big horse-sized pain pills. The doctor said I would be in a sling for a month. No activity except for walking. This was going to be hell. Went back to see doctor for follow-up visit. He said x-ray looks good and that it was a good decision to have surgery - while operating they found lots of small bone fragments floating around which they removed. The doctor gave me two weeks worth of pain killers, but I stopped taking them yesterday. The pain wasn't that bad anymore, and I hated the feeling of being drugged up. I am officially going stir-crazy. I am too tired to do any work or move around, but I can't sleep 24 hours a day. I am mireable laying on the couch, but it is the only place I can get comfortable. Linda sees me as so miserable that she even offers to get Cable TV (something we havbe agreed not to pay for) for the month so I can fill my days with ESPN. I decline the offer, hoping that the worst is almost over. My first real shower!!! I take off the bandanges and let the water rinse over me for an hour or so. Linda says she has never seen me look as sad as I did when I first saw my new scar, which runs the entire length of the collarbone. I tried sleeping in a bed tonight but it was too painful, so I went back to the couch. The pain has almost completely subsided, but it is still very sore to the touch. I have started to walk occassionally. Getting outside has never been so exciting! Finally slept a full night in the bed. I am feeling the urge to do more exercise than just walking. I went to the gym and rode the stationary bike today. I was so bored after 20 minutes that I had to give up and go home. Halloween. My first night 'out'. Went to a Halloween party dressed as a 'one-arm bandit.' Dressed up like an outlaw with my arm in a sling.